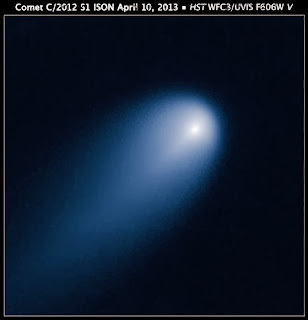 Bodzash Photography and Astronomy: How Bright Will Comet ISON Get? New Predictions! Both astronomers and the general public went abuzz over Comet ISON thanks to a prediction released a year ago by NASA's Jet Propulsion Laboratory (JPL) that stated that the comet could reach magnitude -11.6, or about as bright as the Full Moon. Additionally, besides being shadow-casting bright at night, the comet would be bright enough to easily be spotted during broad daylight. If Comet ISON were to become this bright, it would not be a first, but it would still be the astronomical event of the year should the JPL's prediction come true. Now, less than a week to the (hopefully) big show, some new predictions regarding how bright comet ISON could get have been made. So, how bright could ISON get? Short answer: no one knows, with everything hinging on whether the comet survives its close approach to the Sun, a point where the experts are in disagreement. What we do know is as follows. At the start of the month, Comet ISON was shining around +8 magnitude, where it had been for over a month and a half. Then, without warning, the comet's brightness jumped about 2 magnitudes (or about a factor of 5 times) in visual brightness. By the 16th, the comet was reported as having jumped another magnitude, to about 5th, near the dim end of naked eye visibility. Some current estimates place ISON in the 4th magnitude. Now, how about that close solar approach? On November 28, the comet will pass a mere (in astronomical terms) 732,000 miles from the Sun. Is is this close pass to the Sun, and the resultant melting of the comet that, according to optimistic estimates, push Comet ISON to magnitude -11, or about as bright as the Full Moon. Unfortunately, the same event could also melt the comet and cause it to disintegrate and fizzle out altogether. Bottom line: the only way to see what ISON will do is, literally, to wait and watch. For an intriguing afterthought, according to comet hunter John Bortle through Spaceweather.com (go to the September 25, 2012 archived page), Comet ISON's path closely parallels that of the great comet of 1680, which was bright enough to be seen during the day (just like McNaught). Don't forget to check out my other website!